Click on any of the small thumbnail images below to see a larger version of that image. Navigation buttons back to this gallery page or back to the home page are provided at the bottom of each image's page. Some of these images have a second, even larger size. These images have an "Enlarge" button supplied with the navigation buttons. High resolution prints of some of these images are available for sale at Zazzle. 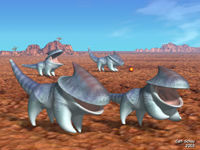 The Pteranodons were modeled in Hexagon, and the landscape was generated in Carrara using an image of tree bark to build the terrain. This picture is dedicated to Carolyn, whose interest and encouragement helped make it possible. 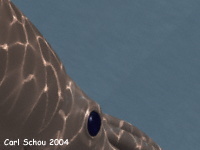 The model of the thresher shark was built in Amapi, mapped in UnWrap3D, textured in PhotoShop, and rendered in Vue. 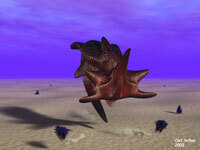 The corals, sponges and plants were a mixture between models built in Amapi, and procedural models generated in Vue. The spacecraft model was built and textured in trueSpace, then imported into Carrara where the landscape and Jupiter were generated. 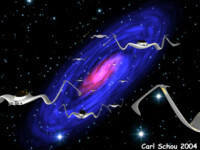 The starfield backdrop was done with the old StarBits program. This picture is presented as a normal image and as two wide-screen panoramas. The models were built in Amapi and Amorphium, then rendered in Carrara using a spherical camera to capture a full 360 degrees around the viewer. If you open a panorama, use your scrollbar to view the entire scene. 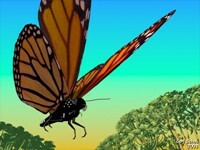 An interactive QTVR movie of this scene may be found in the Animation section. The model was built in Amapi and rendered in Carrara 4 using a volume material plugin from Inagoni to produce the fire and smoke. This would probably make a nice lawn ornament providing your yard is big enough. 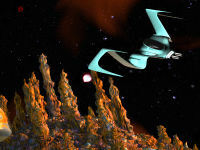 The spacecraft were modeled in Amapi and rendered in Carrara 4, taking advantage of the new terrain and atmosphere models. The textures in the landscape were a mixture of fractal noise and of images of floor tiles made by Strike of the UK. 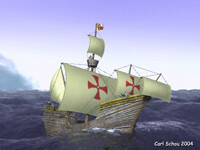 The ship model was based on Columbus' flagship, the Santa Maria. It was built in Amapi, mapped in UnWrap3D and textured in Photoshop. 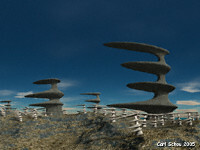 The final render was done in Bryce to commemorate my 4000th post at the Cybernetic Bumper Breath forum. The Giant Squid, Architeuthis Dux, is known to attain a length in excess of 30 feet. 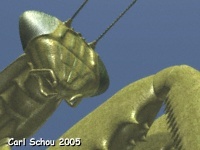 The model of Architeuthis used here was built in Amapi and the final render was done in Carrara. A later version of this model will be more detailed and have textures. My appreciation goes to Dr. Steve O'Shea and the people at the Cephalopod Forum at Tonmo.com for all of their advice and information on this animal. The models in this image were built in Carrara. 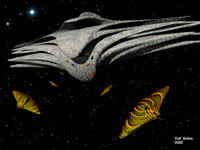 They were then mapped in UnWrap3D and textured in Photoshop with a little touchup in Deep Paint 3D. The final render was done in Carrara. 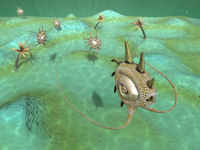 The Return of the TwizzleFish, a scene depicting marine life on another world. As in MorningStar Ascension, light cones and gels were used to produce the final render in Carrara. 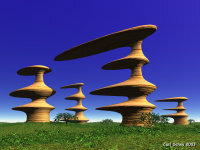 The models in this image were built in Organica out of deformed cone shapes. They were then textured in Deep Paint 3D, made posable in Poser, and rendered in Bryce. A sunrise flight skimming over the clouds of a distant morning, where the rocky crags poke through to reach the sunlight. 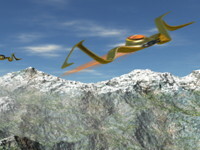 The craft was modeled in Amapi and rendered in Bryce. The rest of the image is made up of terrains, a cloud plane, a volume cloud slab, and a couple of torus shaped volume clouds. High resolution prints of this image are available for sale from Zazzle. The poisonous looking planet and its resident plant life were done in MojoWorld. 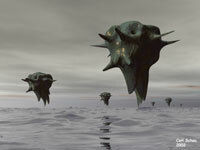 The spacecraft are the models from the Teeth of Dawn picture, created in Amapi and rendered in Bryce. The different images were then composited in Photoshop. Here is another picture using the spacecraft from the Teeth of Dawn image. 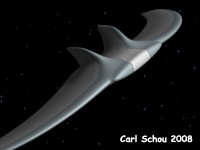 The spacecraft was modeled in Amapi, and the backdrop was made using the Starbits program. Thanks to Patsy Adams for coming up with the name of the Eval-Quadi which I used in the title. 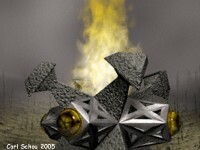 The models were built in XFrog and rendered in Bryce. An image of a kitchen floor tile provided by Strike of the CBB was used to generated the landscape. The butterfly was built, textured, and rendered in Carrara using image maps made from photographs of a mounted butterfly that I bought off of eBay. The plants are Hemlock, modeled in XFrog. The models in this image were made in Amorphium and Carrara. 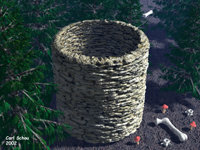 The well was built by displacement mapping a picture of a stone well in UVMapper Pro. The 14 butterflies are the Bryce version of the one used in the Monarch of the Morning picture, built partly with transmaps made from a butterfly I bought off of eBay. The models were built in Amapi 7 and imported into Bryce for texturing and rendering. The ground is made up of several layers of terrains with noise added to produce the vegetation. 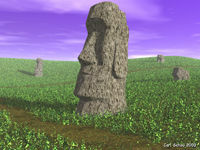 An image of the giant statues (Moai) of Easter Island. The models were built in Amapi from reference photos taken of a 6 inch high replica I bought off of eBay for the project. The textures used for the statues are tiled variations of an image of one of the Sarsen at StoneHenge photographed by Strike of the UK. The ground is made up of several layers of terrains with noise added to produce the vegetation. Rendering was done in Bryce. 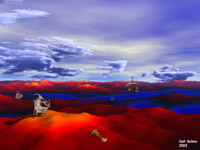 In the Age of Discovery, the weary explorers find themselves in a New World of red rocks and blue magma. Hungry for novelty, the local inhabitants rush to greet the newcomers. There will be a great feast�.. 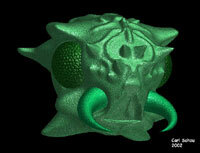 The creature models were built in Amorphium and Organica. The ship model was based on the Santa Maria and it was built in OpenFX. Rendering was done in Bryce. A creature inspired by a recurring dream where I find an old forgotten aquarium which still has some unusual fish living in it. The model was built in Organica. Texturing and rendering done in Bryce. Under a distant sea from long ago�. 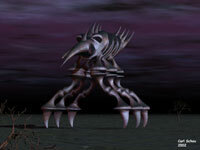 The models in this image were built in Amorphium, and the texturing and rendering was done in Bryce. The models are fractal images that were built in Xenodream, then composited into the 3D scene and rendered in Bryce. This friendly looking little guy was modeled and rendered in ZBrush. Incidentally, there really is a Big Bug Creek. It's in Arizona, along State Route 69 where it passes through the town of Mayer, about 15 miles north of Bumblebee and Horse Thief Basin. The image and modeling was done completely in Bryce. I used to go sea kayaking at night between the Thimble Islands off the coast of Connecticut and have tried to capture a little of it here. This was done entirely in Bryce. I picture the objects moving in an endless progression from some remote origin to some distant destination, all the while reverberating with unheard music. 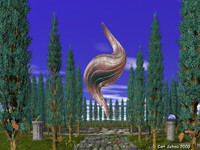 This is the earliest image in this gallery, and my first serious attempt at organic modeling. 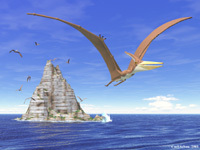 The pteranodon model was built in Organica using the fossil remains at New Haven's Peabody Museum as a reference. It's a static model, so six versions were built to get the different wing positions of the group in the background. Rendering was done in Bryce. The water was made from a tiled terrain whose height map was made from a picture of a zucchini. This is a model of a Kentrosaurus - a relative of the Stegosaurus, that lived in Tanzania during the late Jurassic about 150 million years ago. Modeling was done in Organica, posing in Poser, and painting in Deep Paint 3D. 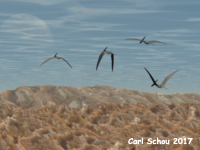 A scene from the middle Jurassic period, 150 million years ago. A mother Kentrosaurus surprises 3 small Syntarsus that were raiding her nest. 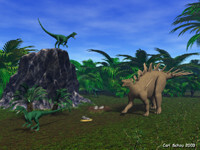 The dinosaur models were built in Organica, painted in Deep Paint 3D and made posable in Poser. The plants were produced with Tree Professional, Plant Studio and the Bryce Tree Lab. Rendering was done in Bryce. Lepidodendron was one of the largest of the Lycopods, the giant club mosses that lived during the Carboniferous period (380 to 286 million years ago), and they grew to a height of 130 feet. 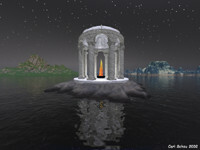 This one was modeled in Organica and rendered in Bryce. The bark texture was produced using an image of a pinecone supplied by Orgo. 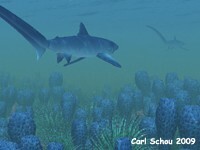 A scene form about 400 million years ago. 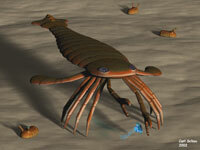 The Sea Scorpion pictured here grew about 2 meters (6.5 feet) long. It and the jellyfish were modeled in Carrara. 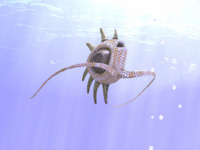 The stalk-eyed trilobites were modeled in Organica. 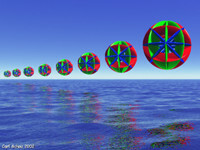 Some grouping was done in Poser. Texturing and rendering were done in Bryce. 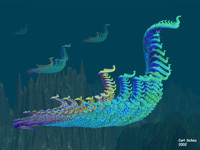 This model was produced in Organica and rendered in Bryce. The title is a reference to the inaccessible Plateau of Leng in the books by H P Lovecraft. 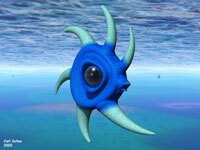 This model was created in Amorphium and it started out as a rather surreal, fish-like creature. When I realized it looked somewhat like a bizarre head when I turned the model upside down, I kept it that way. The final image was rendered in Bryce. I hike a lot at the Old Stone Fort in Tennessee. A photo of the museum's stone wall was used as a displacement map on a cylinder to build the well. The mushrooms were built in Amorphium and the bones were built in Organica. 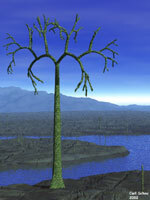 Bryce was used to add the trees, texture the models, and render the final image. 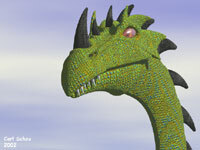 A somewhat whimsical dragon, modeled in Organica, then textured and rendered n Bryce. I have a Bearded Dragon lizard named Bluto who gets this same expression when he spots a cricket.